The southern Indian cuisine is not only tasty but also very varied. While most of the world thinks that South Indian food consists of only dosa and idli, this isn't the case. Traditionally served on banana leaves, there are hundreds of food varieties available when we talk of authentic south Indian food. I have loved and enjoyed the south Indian food recipes since childhood, so much so that my mother was sure that I would choose my husband from the southern states! However, this didnt happen because I fell for a Punjabi boy but my love for everything south has not diminished. 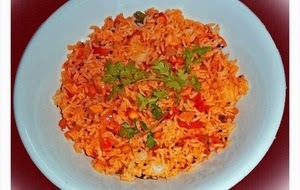 If asked what my favourites food dishes are, I am sure most of it would comprise of the sumptuous south Indian dishes. Now, if I have to share my top five favourite authentic south Indian food then these would be the ones. Haven't we all started our exploration journey through the south Indian food with this dish? I know I did. I still remember the first time I savoured a paneer dosa and the blast of crispness with a nutty flavour of the dosa and the exquisite taste of curry leaves, spicy but lightly cooked paneer filled inside the outer covering had me smacking my tongue and licking my fingers. Accompanied by sambhar which is tur dal cooked with vegetables, tamarind and spices; and coconut chutney and sometimes the tomato chutney, I was on cloud nine. That was the day and it has been years since but my love for dosa has only increased. I have explored masala dosa which contains potato stuffing, set dosa which is thicker than the ordinary dosa: more like pancake with no stuffing, paper dosa which is just the outer covering with no stuffing, onion dosa which has onion stuffing, rava dosa which is made from semolina or rava/suji and very creative experiments like the kadai paneer dosa, chilly chicken dosa, chowmein dosa etc. Dosa has evolved but the originality of this recipe is still present and this recipe rules the hearts of foodies all over the world! Your experience of the south Indian food is not complete if you haven't tried a dosa. 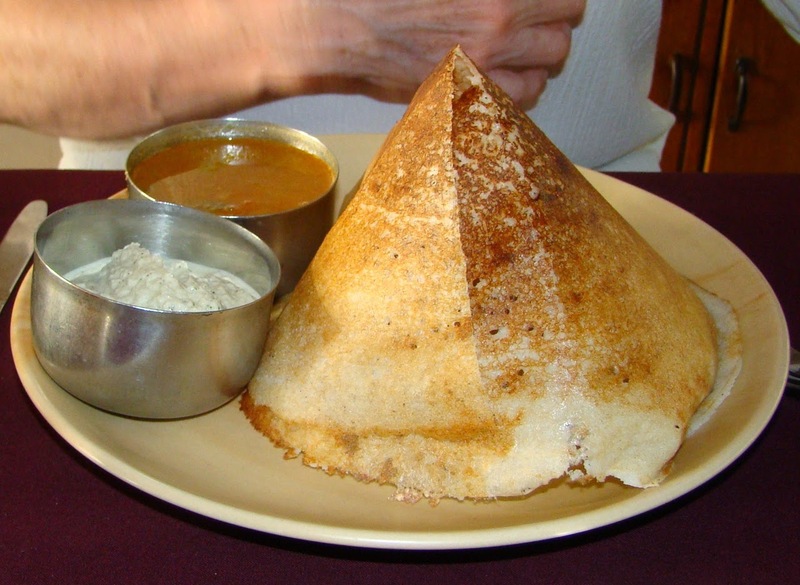 I loved this cone style representation of the dosa eversince I first saw one in Mysore! Idli is one of the favourite breakfast dishes in the south. It is a steamed circular cake made of rice. Served with sambhar, coconut chutney and tomato chutney, it is light, filling and a prefect dish for weight watchers. It contains no fat and is super tasty! 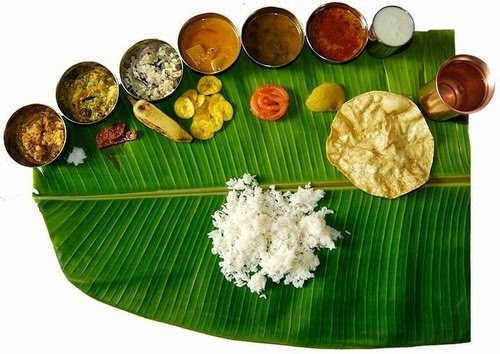 A thali is like a meal platter which contains various food dishes arranged in one plate or banana leaf here. 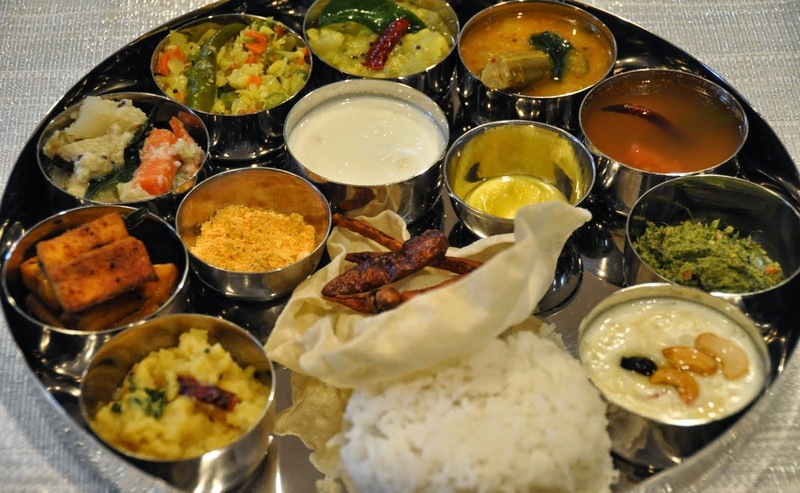 The south Indian thali can be an elaborate one with any number of south Indian food in it or it can be a simple one with just the basics like rice, sambhar, chutney, a sweet and a papad. The idea behind a thali is to get spicy, sweet, salty and sour flavours at one place and also get a full tummy. South Indian thali is a great way to experience various south Indian food at one place and at one time. A great bargain, I love seeing, smelling and tasting the colourful dishes served in the thali and often go for it when I need a full and lip smacking meal. 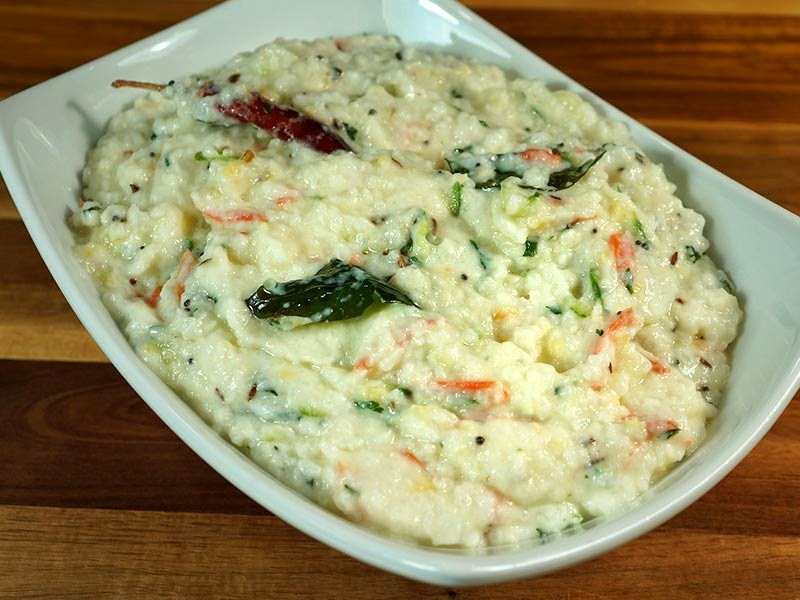 Curd Rice is a yummy and lip smacking dish that contains rice, yogurt, curry leaves, dried red chillies, sarson and occasional vegetables like carrots. It was the love for curd rice that brought me and my now husband closer. He loved curd rice just like me and over a hot, steaming plate of this south Indian food, we connected and fell in love! Slightly tangy, curd rice is a famous recipe enjoyed by the south Indian families and a filling food that leaves you wanting more. Since rice is available in abundance in the southern parts of India, majority of South Indian food dishes use rice. Apart from curd rice, there is lemon rice, tamarind rice, tomato rice etc. 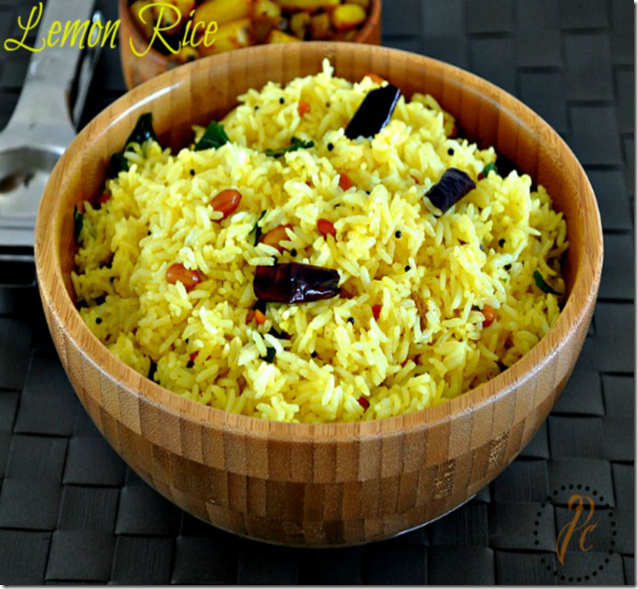 This tamarind rice and the lemon rice are another very innovative and tasty concoctions using rice which leave a burst of flavours in our mouth and the satisfaction of a full stomach! 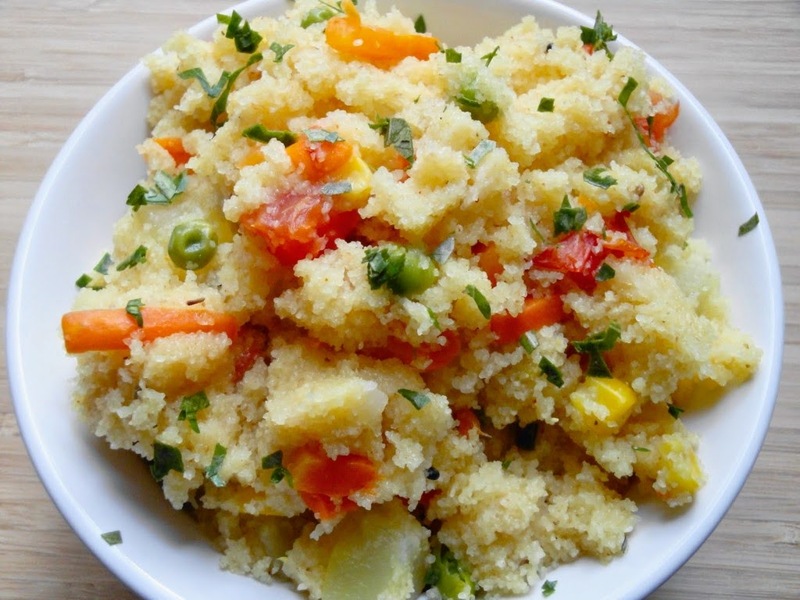 Upma is another delicious south Indian food option which is a healthy snack. We usually have it for breakfast or in the evening. Made with rava/suji or semolina, it requires minimal oil, has the option of adding any vegetables that we want and is ready in under 5 minutes. Tasty, quick and easy to make, I absolutely adore this dish. Eat it with chutney or a hot cup of tea and enjoy savour its deliciousness. These are only a few south Indian food dishes that I love. If I go into more details, I don't think one post is enough to tell you about all the south Indian food that I like and love. Having resided in Chennai and Mysore for sometime, I got to experience the south Indian food very closely and then when I relocated to the Delhi area, I was happy that the authenticity of the south Indian food has been maintained here too. If you are in Delhi then you will be able to enjoy not only the mughlai, chinese, authentic north Indian but also the authentic south Indian food here. Being the capital of India, Delhi has some of the most varied and most happening restaurants in the world which serve the best food from around the world right here in one platter. Don't wait. Get dressed and step out to experience the authentic south Indian dishes right here in the south indian restaurants in Delhi!